A few weeks ago the summer arrived. Goodness, we waited long enough! And the temperature in the polytunnel started to soar. While we do remember to water the plants in here, it can be a bit hit and miss. We decided that the plants might benefit from some regular watering and have installed a Hozelock automatic watering system. It is relatively cheap and it does look like the plants appreciate it. It is set up to water them for 10 mins twice a day (6am and 6pm avoiding the heat of the middle of the day). We started with the Hozelock starter kit, but within a week had to upgrade the timer. The original timer (Hozelock 2705 supplied in the starter kit) had presets (twice a day for 5mins, twice a day for 10 mins etc), but you couldn’t amend the schedule. The other reason for the upgrade was the original one packed up! I thought it was flat batteries (it uses two C type batteries), but when I opened the battery compartment, it was full of water! Even after trying to dry it out (and with new batteries), it was still dead. Ho hum. 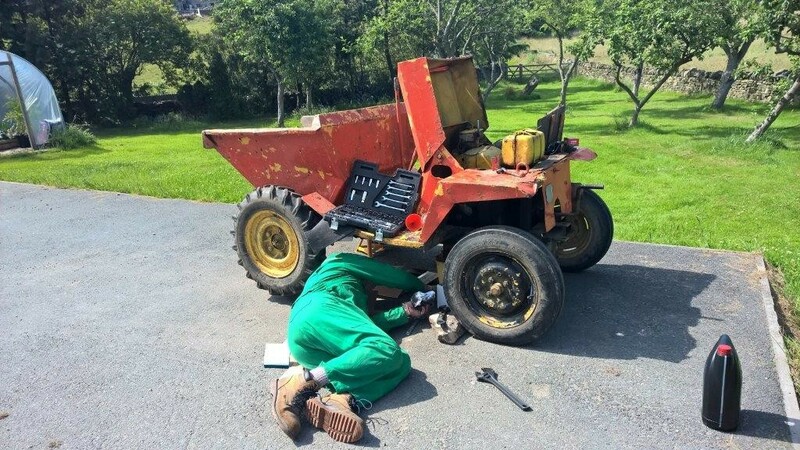 I will put it down to operator error, but I thought I had tightened up the back of the compartment properly (it is screwed on and has a rubber gasket to keep the water out). The upgraded unit (Hozelock AC Pro) while a bit more expensive does seem to do the trick. It was easy to set up and I like the over-ride facility in case you think the plants need some additional watering during the day. It did come with a rain sensor than cancels the watering program if it rains. However, this isn’t of much use in a polytunnel! We added some bits to the original starter kit – in particular, we add a couple of spray nozzles and these seem to work a treat. When then have drippers that feed the courgette plant and drippers in each of the tomatoes plants. The system has been really quite flexible and B&Q (not one of my favourite stores) does seem to stock a lot of the bits for this system. 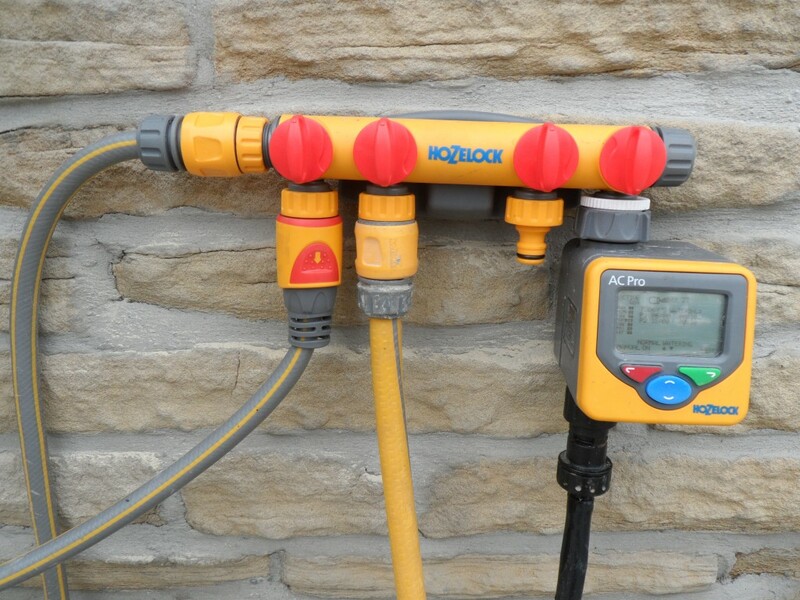 The other thing that seems to work well is the Hozelock extension bar that means that we don’t need to keep unplugging hoses if you need to fill a watering can or wash the car. We had to install an “extension bar” to be able to connect up all the Hozelock devices. At £25, it is expensive, but it does mean that you don’t have to keep unplugging hoses to fill up a watering can or wash the car! Last year we cleared out some land to the side of the house to use as a vegetable patch. It was hard work – the top soil was thin and full of large stones. We had a go at clearing it and topped up the top soil from a left over pile of soil in the top field. We had some success with it (the onions were very good, the cabbages were a disaster), but it was a really pain to keep on top of the weeds. 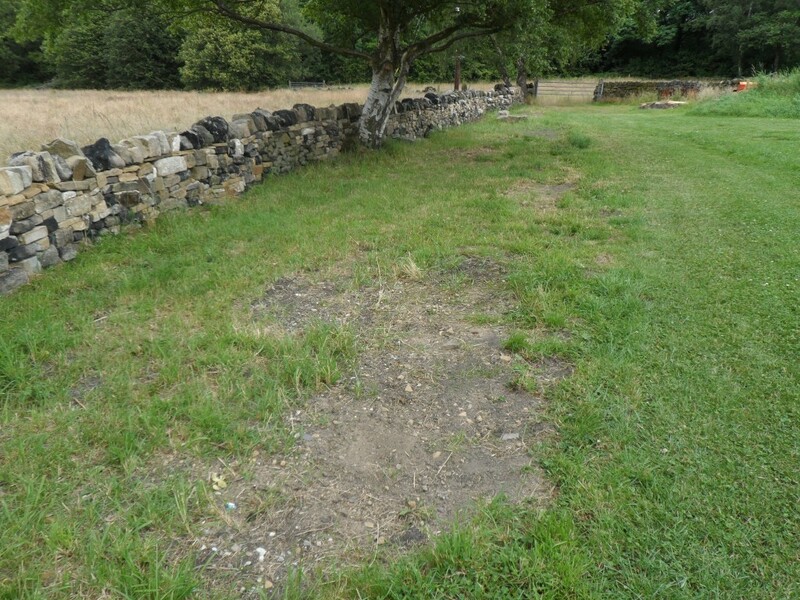 With the wall along the top field now being clear, we thought we might put some raised beds along this wall. However, we thought it might be worth giving our original vegetable patch one last go. This stretch of field is also under the trees that seem to stuck the water out of the ground – while they do provide some shelter, they take most of the water. 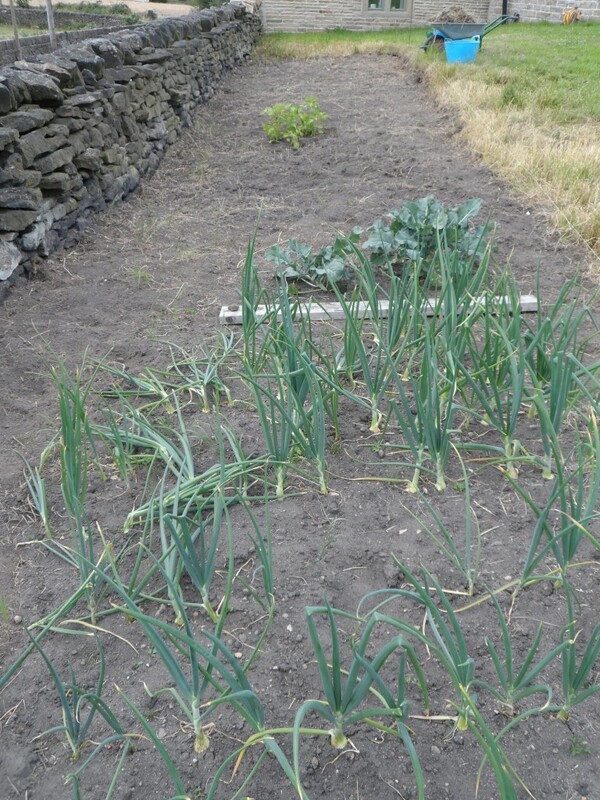 We had planted some onions in the original vegetable patch earlier the season, but then lost heart as the weeds took over. We have been at home for the last week and decided to clear the vegetable patch up. We had used a JCB earlier in the year to dig it over when we had a machine on site to fill in the ruts, so much of the soil was quite loose. It still took Jo a lot of effort this week, but it does look good. 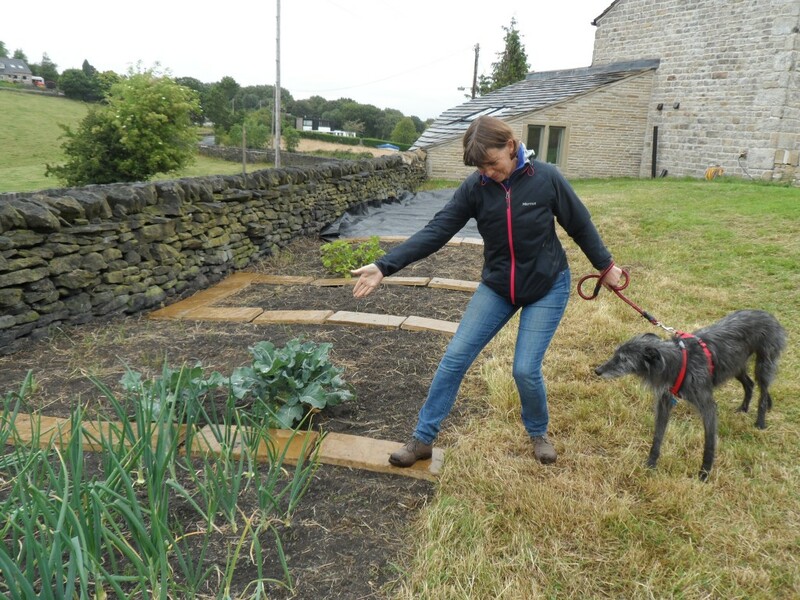 Jo has been digging over the vegetable plot over the last couple of days. Much of it had been turned over previously with a digger, but some of it had never been dug before. This is the view from the other end and it is a big plot – 3m x 15m. 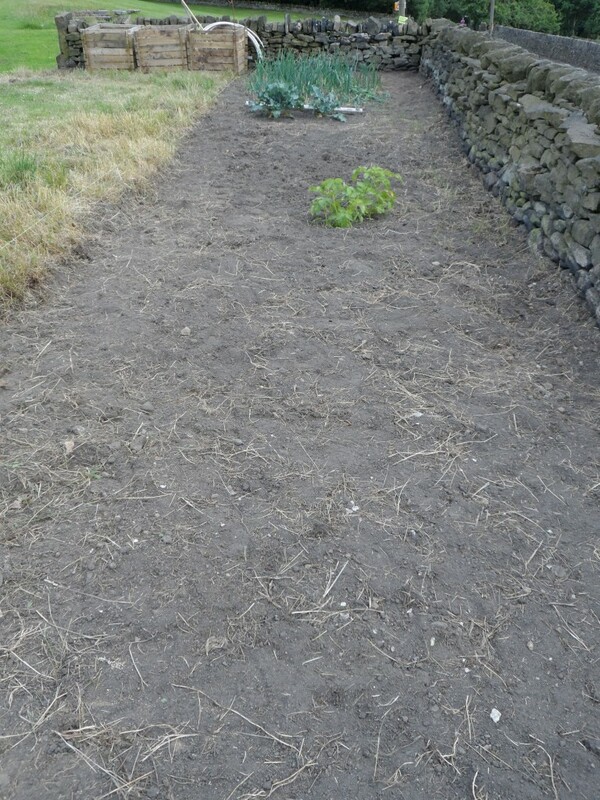 The potatoes that you can see in the middle distance were left over from last year – we have dug up some of the other left over plants and the potatoes are surprisingly ok.
All Jo’s efforts this week have made a huge difference to the vegetable patch. 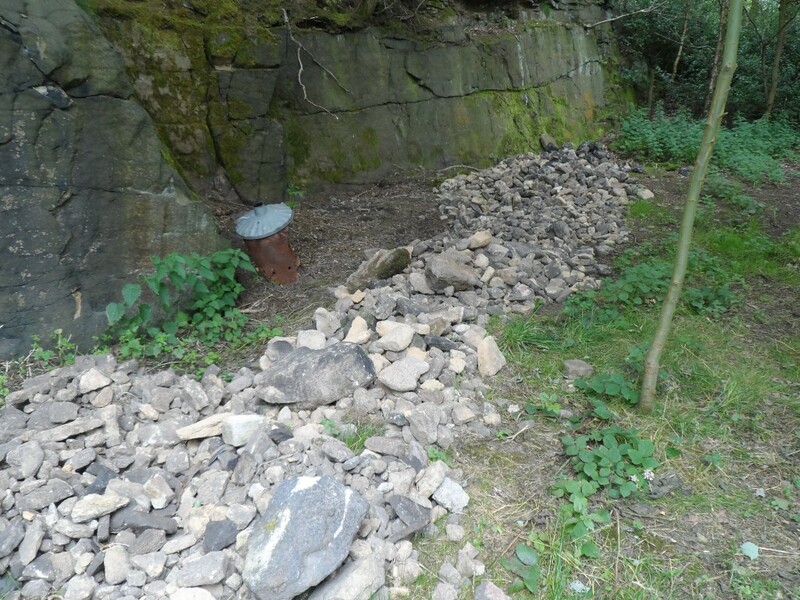 We have had 2 or 3 dumper fulls of stone out of here in the last few days, not to mention the undergrowth and weeds. We managed to purchase some cheap patio slabs from a local supplier and have used these to make pathways between the beds. If we decide to reconfigure the beds the slabs can be picked up and moved. 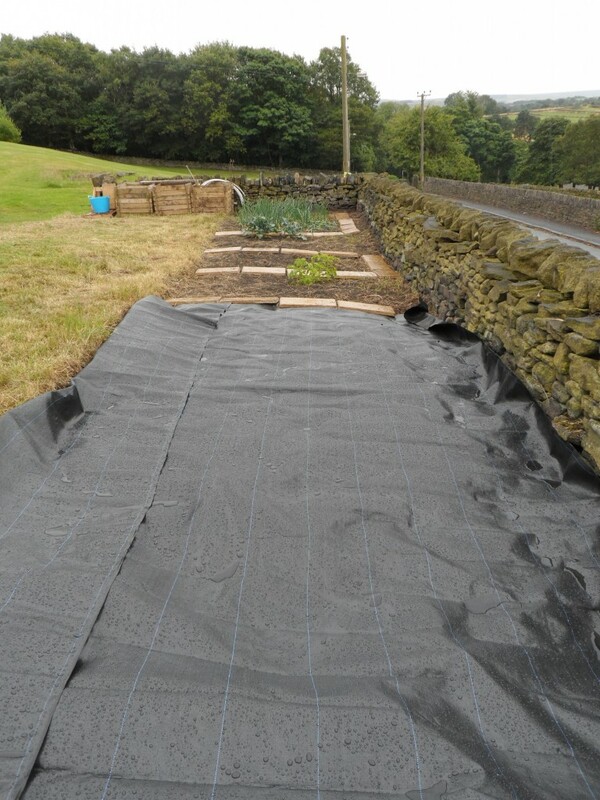 We aren’t quite sure what to do with the one end of the patch so we have covered it with geotextile to keep the weeds down. 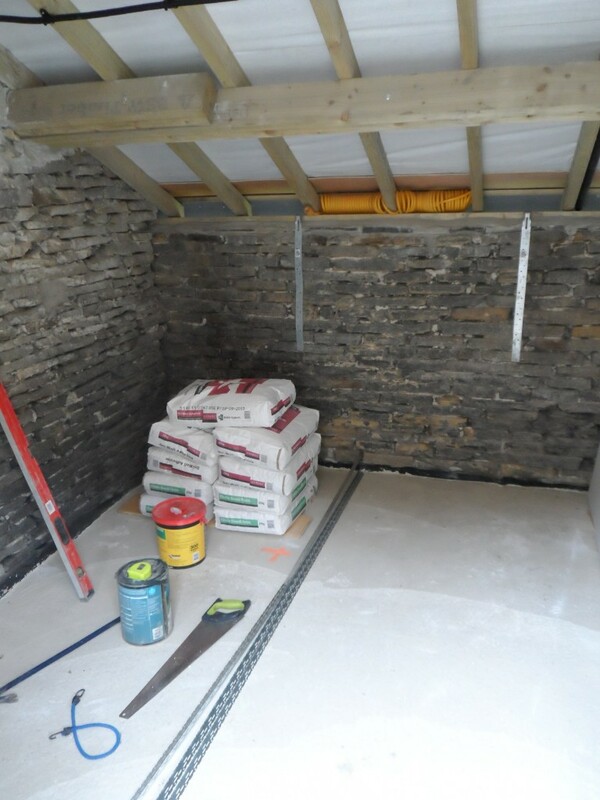 We put the last of the concrete floors in to the outbuilding earlier in the month. We will use this middle shed as a workshop and have decided to dry line and plaster this shed. This will make it a little more free from dirt. Hopefully, we will get this plastered in the next couple of weeks. When we think about the amount of money been spent on these outbuildings, we might have been better off knocking them down and starting again. The upside is that the outbuildings which have probably been here 200-300 years have a new lease of life. 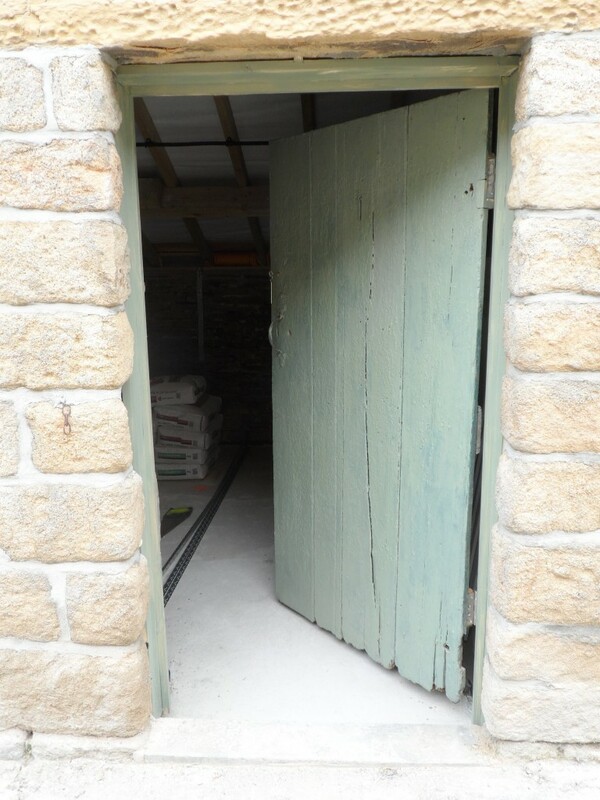 We have put down a concrete base in the middle shed in the outbuilding, now all three sheds have proper concrete floors. This means that the outbuilding is now a lot dryer than it has been in the past. We have decided to get this shed drylined and plastered. This should make this shed a bit more dirt free (this area had been used previously as a coal hole!). In advance of the middle shed being plastered, we have put in a new door frame so that the dry lining can be fitted up to the frame. For now, we have put the old door back on (with new hinges and trimmed to make it a little more square). We rebuilt the dry stone wall in the bottom field a few weeks ago, but now that we have a dumper we can sort out the coping stones. The coping stones have been reclaimed from the huge pile of stone that was left over from demolishing the old barn. We built this wall in the bottom field a few weeks ago, but waited until we had our new dumper before putting the coping stones on. Much of the coping stones came from the huge pile of stone that we had left over from demolishing the barn. We used a line to get the top of the wall straight and level. It is amazing how this simple approach produces a very straight line. The wall is made up of all sorts of different stone (and the occasionally brick!) from around the property. 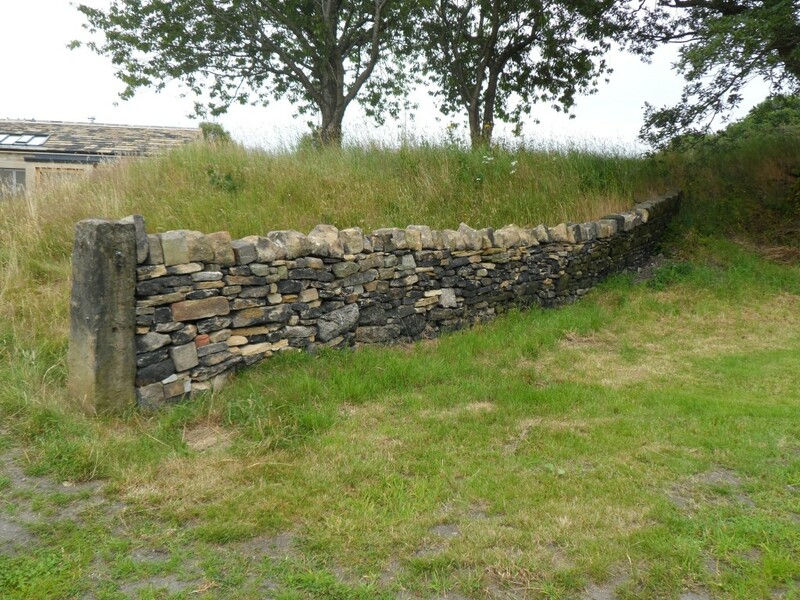 If nothing else, the wall is a good way of getting rid of a lot of the surplus stone. 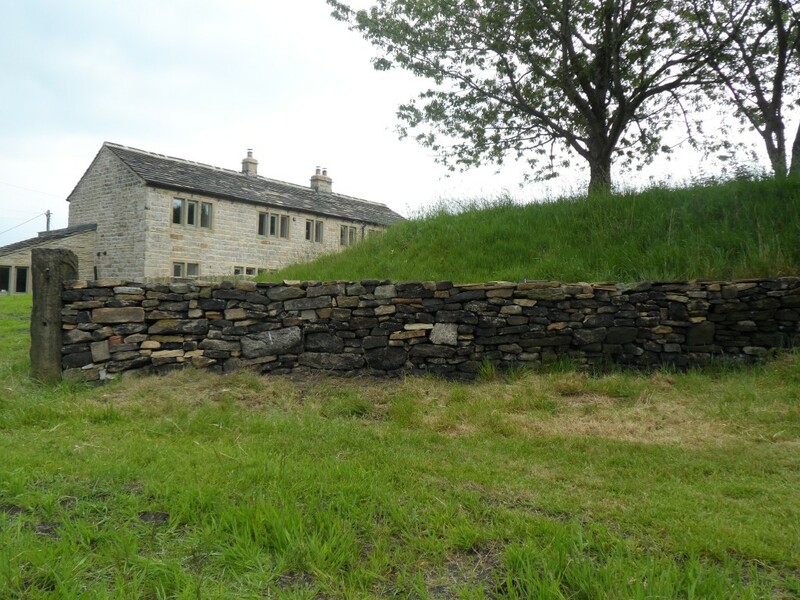 We finished the dry stone wall along the orchard and top field last month and had quite a bit of stone left over. With the arrival of our new dumper (well, new to us), we were in a position to move the stone out of the way into the bottom field. This means that in time we should be able to mow the grass up to the new wall. All in all, it took about a dozen trips in the dumper. 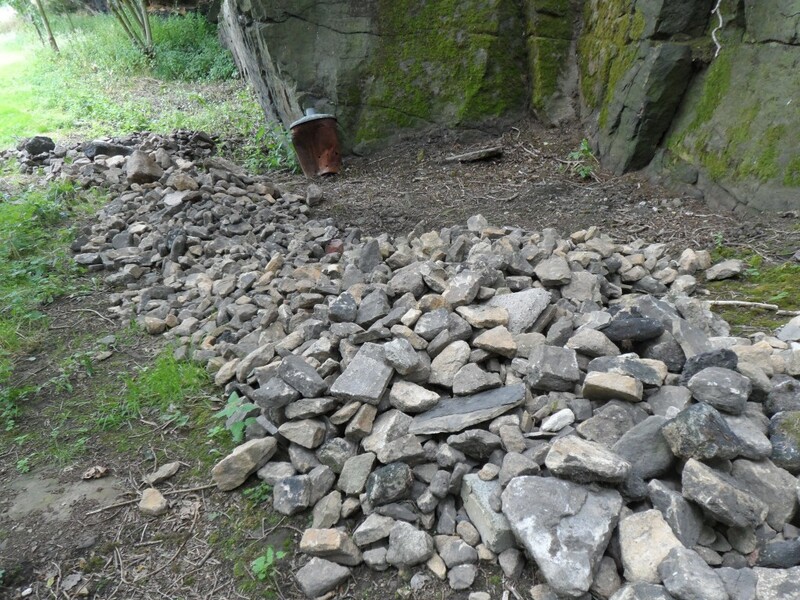 There was a lot of odd (and orrible) stone left over when building the dry stone wall – rounded lumps of stuff that weren’t of any use in a wall. All of this has now been moved and the grass is starting to grow over the bare batches. If we had had a bit more rain, I think this would look a lot better, but time will tell. We have a bit of land in the bottom field under the trees where we have been dumping the left over stone from the top field. There must have been a dozen or so dumper worths here. Some of this stone will be used for building a new wall here, but some of it is just junk. Unfortunately, the incinerator got a bit too close to the dumper. Ho hum. 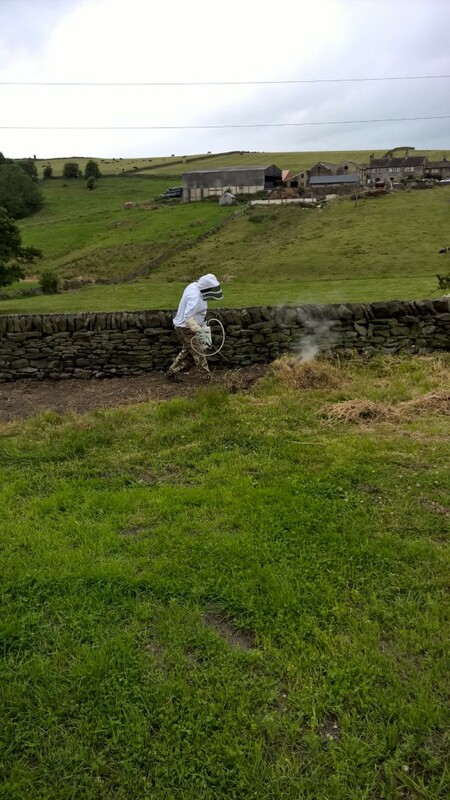 Now the pesticide has had an effect, we can dig out the wasp nest. Although the entrance was only very small (no bigger than a 50p piece), the nest was bigger than we were expecting. Now the pesticide has had an effect, Jo was feeling brave enough to have a go at digging out the nest. It seems to have at least three different levels inside. But nothing alive anymore. 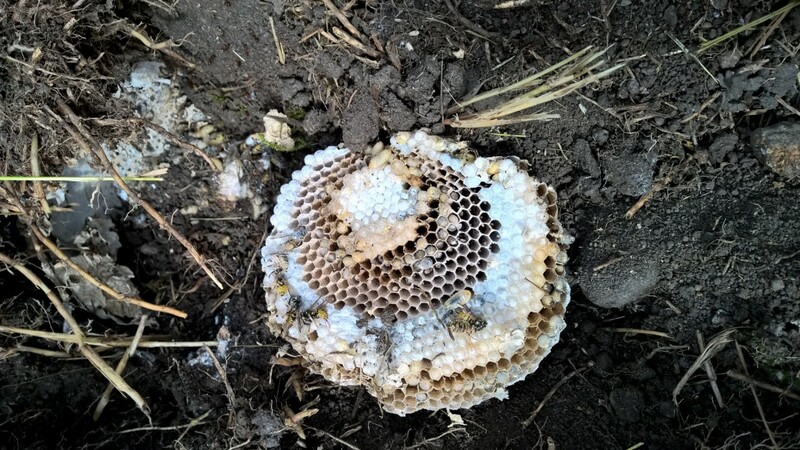 Last year, we had a couple of wasp nests – one in the orchard and another in the bottom field. We were lucky. A very nice badger came along and dug both of them up and then ate the lavae. This year we have a wasp nest in the vegetable patch. Given that the have a couple of months to go before they reach the end of the season, we decided that we had to get rid of it. Otherwise, someone (me, Jo or the dog) are going to get stung. Jo got stung last year and she isn’t that keen to be stung again. 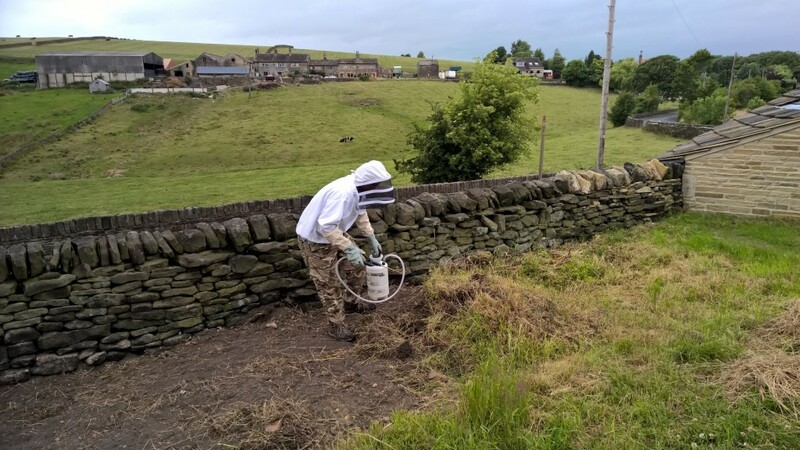 Given that it is a vegetable patch we weren’t that keen on using pesticides here, however, we are assured that the chemicals breakdown as soon as they are exposed to sunlight. Even so, I don’t think that we will be planting anything at this end of the vegetable patch this year. Jo’s idea was to whack the wasp’s nest with a mattock and then run as fast as you can! I think the only thing that this approach would guarantee would be some pissed off wasps. Alternatively, you can get someone suitably attired to spray them with chemicals. I’ll vote for the man with the can! Not quite sure what is going on here, but it looks like the insecticide might being having an effect! Turned out the poor performance didn’t have anything to do with the engine – the right hand front brake was seized on! Good job I didn’t go to the hassle of changing the diesel injector! The brakes have now been sorted together with new oil, new oil filter, air filter and fuel filter. I am proud to say that I managed to do it all myself. It seems to run a bit better although I do wonder if it was worth all that effort. Despite its age, parts are readily available and I even managed to find a maintenance manual online. We fixed the ceased brakes and then change the oil, oil filter, air filter and fuel filter. It seems to run (and stop) a little better than when we first bought it. 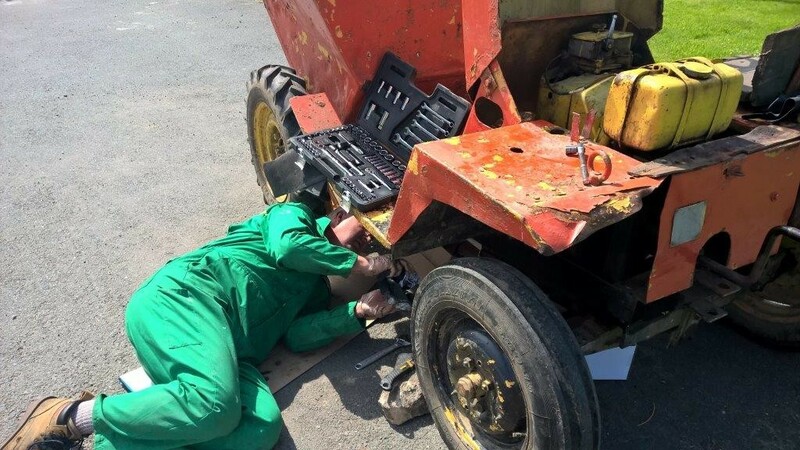 These are pretty easy machines to work and designed to be repaired in the field (pardon the pun! ).